Growing in Grace Podcast: 580. 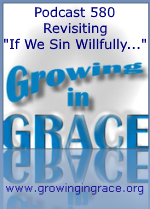 Revisiting "If We Sin Willfully..."
580. Revisiting "If We Sin Willfully..."
As we talked about a couple of podcasts ago, the writer of Hebrews was telling his readers that the animal sacrifices through the law came to an end, so they were not to go down that path anymore for forgiveness of sins, but rather they were to believe in the one sacrifice of Jesus that was sufficient for all sins for all time. If they reject the one perfect sacrifice of Jesus, there no longer remains a sacrifice for sins. That’s really what Hebrews 10:26 is saying. During a discussion on social media, a statement was made by someone that the sacrifice of Jesus "does NOT cover willful sinning." That is quite a breathtaking statement - and quite sad - and it misses the entire point of the book of Hebrews. So this week we dig a little more into this controversial passage in Hebrews. We also take a look at other scriptures about sin being taken away, that have no such added conditions regarding "willful" sin. Many scriptures plainly say that we are saved by grace, through faith (by believing), and they do not add any such caveat that this isn’t true if we sin willfully. In fact, many scriptures highlight the fact that we have the forgiveness, remission and removal of ALL sin through the blood of Jesus. The book of Hebrews was not written to scare believers, but rather to assure them of the sufficiency of the blood of Jesus. The warning about "willful sin" was not directed at people who sin, but rather at people who reject the sacrifice of Jesus as the only sacrifice that takes away all their sin. 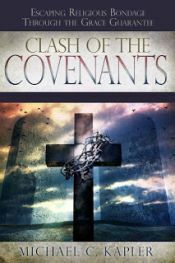 Under Old Covenant Law, one could atone for _any_ type of sin (especially "willful") with the appropriate animal sacrifice, and a Levite priest. To make the claim that there now is a type of sin Jesus' blood does *not* cover makes His perfect and holy blood less powerful and less effective than those animal sacrifices of the Old covenant, even though scripture said that those animal sacrifices didn't "take away" sin, but only covered it. Is there really any Christians wanting to make *that* claim, that Jesus blood didn't take away our sin, and didn't even do as good a job as the blood of goats in covering it up? If that were so, Jesus *really* wasted His time and God made a mistake by giving us a new (and worse) Covenant. Very good point, Connie, and sadly there are people who do make the blood of Jesus out to be smaller than the Old Covenant sacrifices by making the claim that His blood didn't cover certain sins. I don't think they realize just what it is they're saying.